Westfield, Ma - Westfield Starfires Director of Baseball Operations, Evan Moorhouse, announced the signings of four members of the American International College Baseball program. 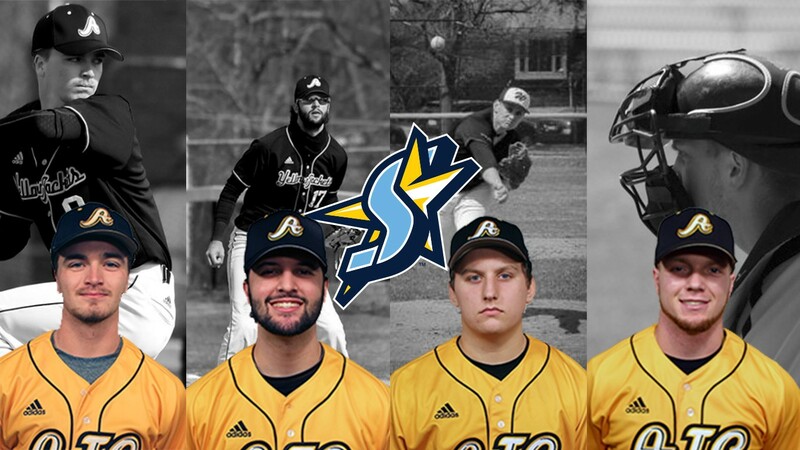 Matt Costanza (P,INF), Andrew Ciacciarelli (1B/OF), Mason St. Pierre (P), and Anthony Clark (C) will represent the Yellow Jackets on the Starfires roster in 2019. Both Costanza and Ciacciarelli are amidst their Junior campaign for the YJ’s, who stand with a 9-8 record to begin the 2019 Season. Ciacciarelli comes to the Futures League after seeing time last summer in the NECBL with the Upper Valley Nighthawks. Costanza was an NE-10 First Team All-Conference selection as well as an All-East Region First Team selection for the D2CCA and NCBWA in 2018. The other two signees, St. Pierre and Clark, are very familiar with their summer home. The two Westfield, MA natives were battery mates for the Westfield High School Bombers a few years ago. The pair renewed that connection in a recent Yellow Jackets win over St. Anselm that saw St. Pierre toss six innings while allowing one earned run, and Clark go 2 for 3 at the plate with a double and a stolen base. Anthony, a sophomore, and Mason, a freshman, are expected to play key roles for AIC Head Coach Nick Callini and his staff as the season continues. © 2019 Westfield Starfires. All rights reserved.